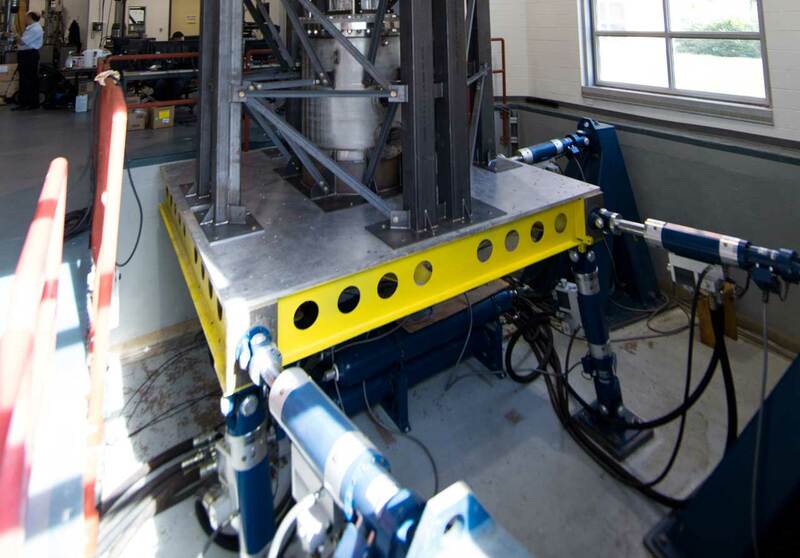 A Close-up View of the Movements of the Model’s Nuclear Reactor Core Rods During a Simulated Earthquake in the Earthquake Engineering and Structures Laboratory at GW’s Virginia Science and Technology Campus. When the 9.0 magnitude earthquake struck Japan’s Fukushima Daiichi nuclear power plant four years ago today, a series of events triggered a meltdown of three of its six nuclear reactors, resulting in the largest nuclear incident since Chernobyl. The disaster sparked global interest in learning more about the behavior of nuclear reactor cores during earthquakes. According to the Nuclear Energy Institute, 437 nuclear reactors in 30 countries produce more than 12% of the world’s energy and ensuring their safety is critical. The GW research team is leading the way to new discoveries. Bardet and the rest of the GW research team, all from the School of Engineering and Applied Sciences (SEAS), includes Elias Balaras, professor of mechanical and aerospace engineering, and Majid Manzari, professor of civil and environmental engineering and doctoral students. Each of them brings a unique expertise to the interdisciplinary project—Bardet: fluids, Manzari: earthquakes and Balaras: simulations on supercomputers. 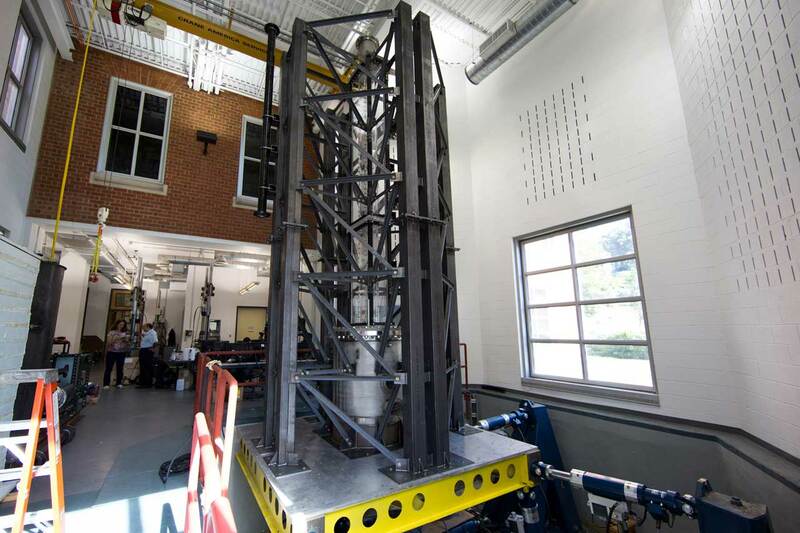 The team members, awarded more than $860,000 in 2012 by the U.S. Department of Energy (DOE), are now testing their model of a nuclear reactor’s core on a “shake table” located in the Earthquake Engineering and Structures Laboratory at GW’s Virginia Science and Technology Campus in Ashburn, Va. Their access to one of the most sophisticated earthquake simulators of its kind in the nation is allowing them to collect unprecedented data on what happens to the nuclear reactor’s fuel rods during different magnitude earthquakes. 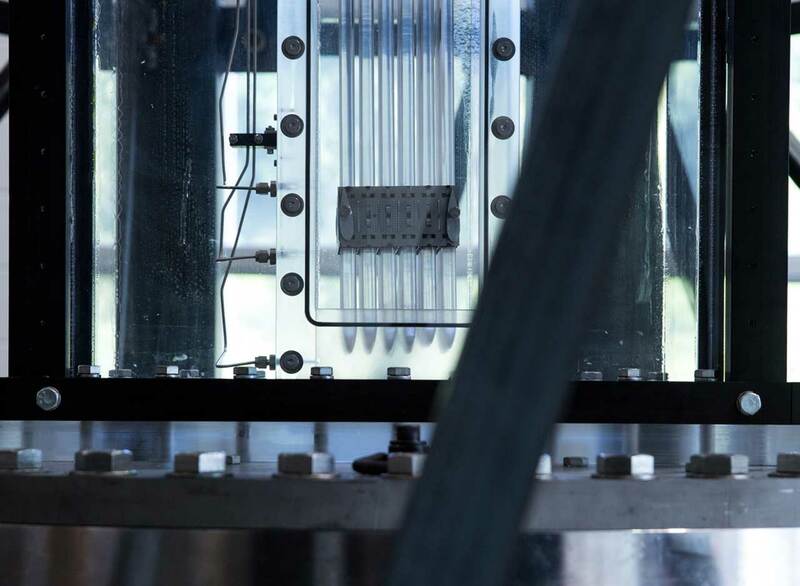 In the first video clip, above, you see a close up view of the model’s nuclear reactor core fuel rods moving on the Shake Table during a simulated earthquake. The scientific constraints used to run the study are consistent with typical operating conditions inside a common type of nuclear reactor, however on a much smaller scale. 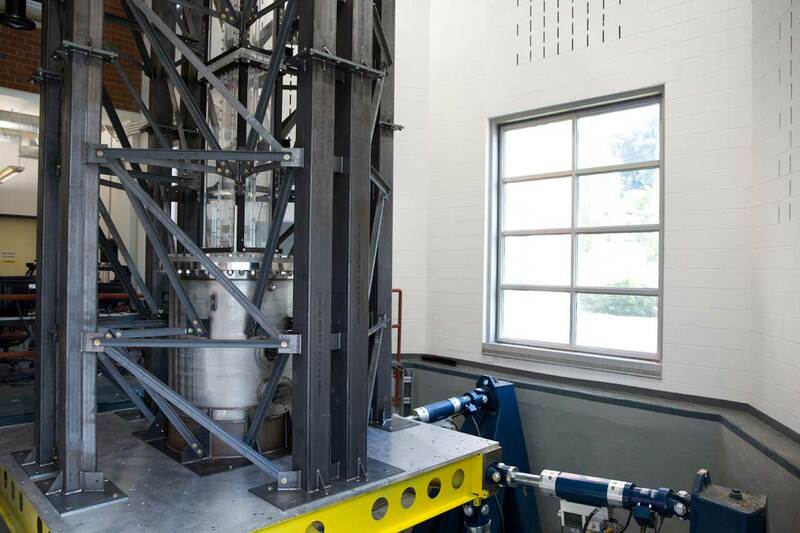 The model consists of a single bundle of simulated fuel rods compared to nearly 200 in a full size reactor. Normally the fuel rods generate heat and are cooled down by highly turbulent water flowing vertically around them. The heat is then utilized to generate electricity. 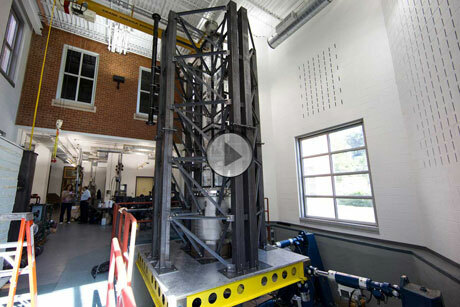 in the Earthquake Engineering and Structures Laboratory at GW’s Virginia Science and Technology Campus. In the second video clip you can appreciate the magnitude of the model with a floor-to-ceiling view. In this video you can see the vibrations of the shake table and the structure sitting on it. The team has been focusing on the interaction between the fuel rods and the fluid around them. This is the first time a model of this type is being tested with a combination of ground motion, fuel assemblies, and turbulence flow running through the model. Data are being collected with seven different types of high-precision non-intrusive instruments including several lasers and high-speed cameras. While analyzing early data from this three-year study, researchers used 3D simulations to identify previously unreported behavior related to fluid flows induced by the structure motion. The researchers are continuing their data collection and analysis. The new behavior they have already identified could be significant for future nuclear modeling and R&D, as could other findings yet to be discovered. 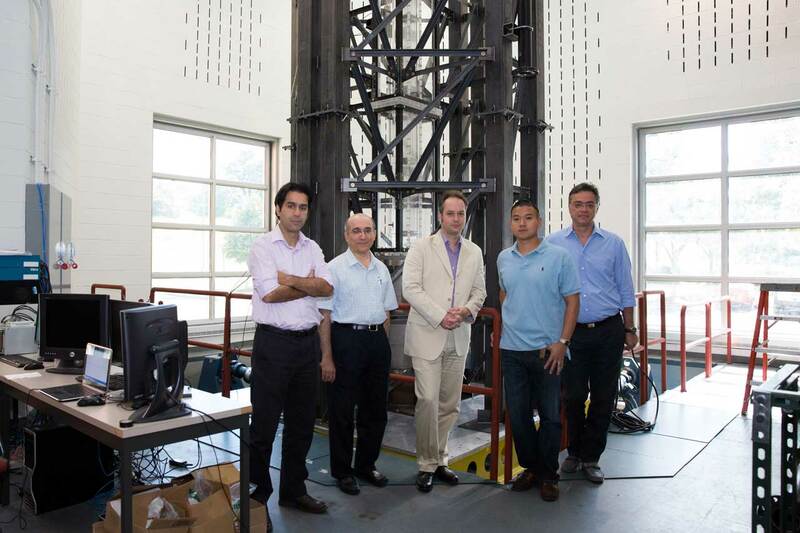 The research team from left to right, Morteza Rahimi, Prof. Manzari, Prof. Bardet, Noah Weichselbaum and Prof. Balaras, pictured in front of the model they built on the "shake table." Model of nuclear reactor core on shake table. 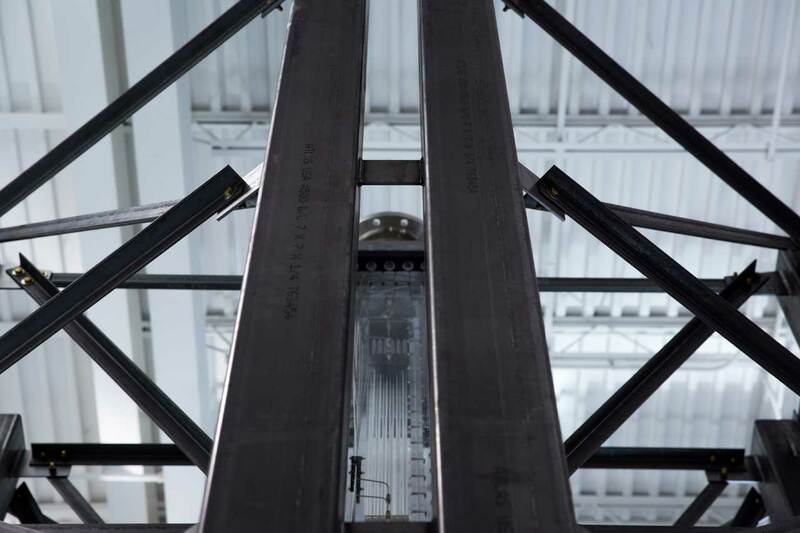 A floor-to-ceiling view of the nuclear reactor core model on the "shake table." 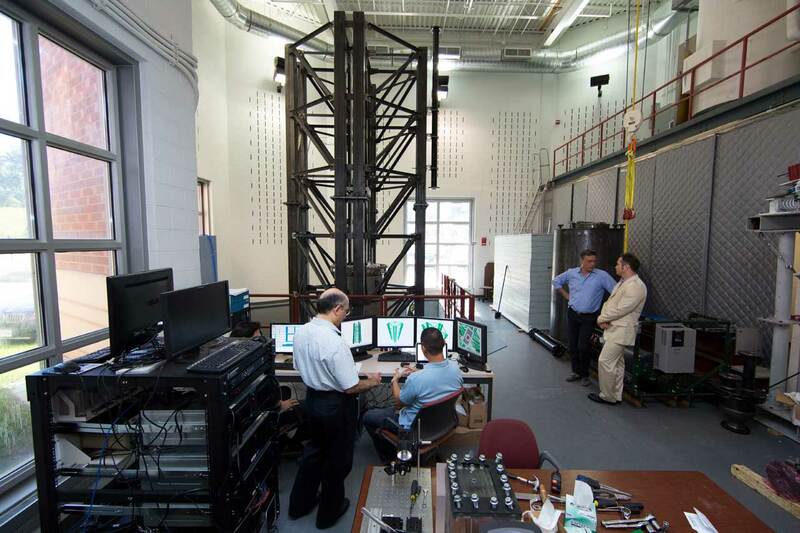 Researchers simulate an earthquake using sophisticated computer equipment and the "shake table." A different angle of the nuclear reactor core model on the shake table. 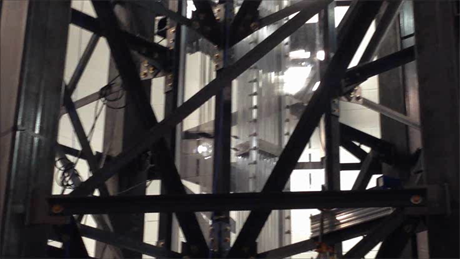 Close up of the "shake table" in the Earthquake Engineering and Structures Laboratory at the GW Virginia Science & Technology Campus. 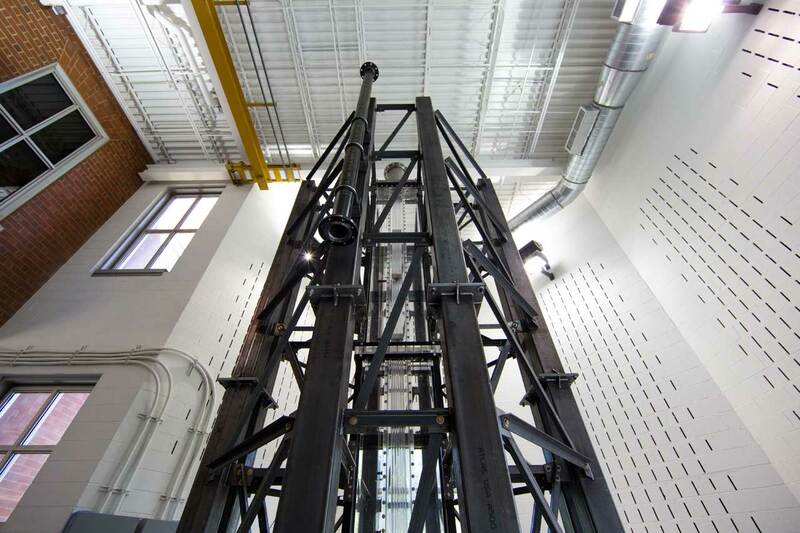 The shake table is one of the most sophisticated earthquake simulators of its kind in the nation.